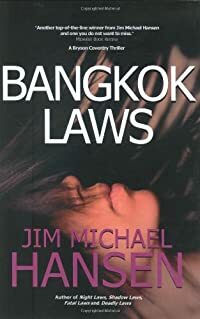 Bangkok Laws by Jim Michael Hansen, a Mysterious Review. Review: Denver homicide detective Bryson Coventry investigates a number of seemingly unconnected crimes in Bangkok Laws, the fifth mystery in this series by Jim Michael Hansen. The first crime, a murder, seems fairly routine, a man repeatedly stabbed in the back. Obviously a crime of passion, yet there are no suspects. Then a woman is killed, her neck broken, and left outside a home she was preparing to clean. Inexplicably, her roommate has disappeared. Then another woman, the daughter of a prominent television personality, vanishes. Though nothing connects any of these crimes together, Bryson begins to suspect that his new lady friend, Ja'Von Deveraux, is somehow involved. She has hired a recently licensed and inexperienced lawyer to sue the largest and most prestigious law firm in Denver, a legal mismatch if ever there was one. And then a common thread emerges: Bangkok. Bangkok Laws alternates between three points of view: Bryson Coventry and his investigative team, Ja'Von and her lawyer Paige Alexander, and a contract killer named Dylan Joop. Since there are no obvious connections between them, it could be confusing to the reader exactly what's going on and why. Furthermore, the pace of the plot is relentless with never much time spent on one point of view before moving on to the next. Yet the author handles it all brilliantly with an amazingly deft touch. Improbable coincidences in another context seem perfectly reasonable here … or at least credible. A suspense novel to be sure and there is some misdirection, but most readers will no doubt figure out well before the end how the various plot threads come together. This in no way, however, lessens this thrilling adventure. In a nod to, and with respect for, Alfred Hitchcock, the author inserts himself in a scene or two, and titles of his books seem to appear on most of the character's bookshelves or nightstands at one point or another. This, like much of the rest of Bangkok Laws, is more clever than contrived and ultimately works as pure entertainment. Acknowledgment: Jim Michael Hansen provided a copy of Bangkok Laws for this review.